Some years ago I bought a used Tektronix 'scope plugin on ebay. Almost immediately after I powered it the +5V supply crowbar'd from a dead short. I could tell by smell and the burnt look which cap in the new plugin it was. Today, about 10 years later, I realized I should have changed the two in the bipolar supplies. The one cap shorted after about 5 minutes of use after being powered down for years. A bead of hot molten tantalum flowed out of the fissure. I replaced both caps with Aluminum electrolytics so I wouldn't have to do this again. This is what classic bead tantalum capacitor failure - when used in bypass applications - looks like. I would hope tantalum is more robust these days, but modern low esr aluminum is cheaper and safer. I got tired of trying to figure out how to keep them happy in high current ripple applications. Though I hear the tantalum polymers are quite a bit more tolerant high ripple current...the little beasts are way to rich for my blood. have you noticed how difficult it is to source some types of MLCC's lately? I am seeing over 1 year lead time on specialized ceramics now...prices are going up due to supply and demand. It's getting ugly out there...What in the world are we supposed to use for decoupling caps now? Films? My products all just grew by 50% in size. I had an unfused Tantalum burn a 1" charred hole about 30 years ago in a PCM3324 card. I'm glad Sony decided to replace it for free. Aren't most modern SMT Tantalums fused? The one in the Sony was a Kemet and wasn't fused. If the fuses stop the explosions, it might convince me to consider straying from the flock. Hard to deal with, expensive parts that fail safe are better than not shipping due to long lead part sourcing problems. I've also experienced the cratering. Often the collateral damage seeming much more dramatic than the energy involved in the circuit could apparently account for. I seem to recall , my memory escapes where at the moment, some or all using magnesium in the manufacture of the leads. That might explain the craters. 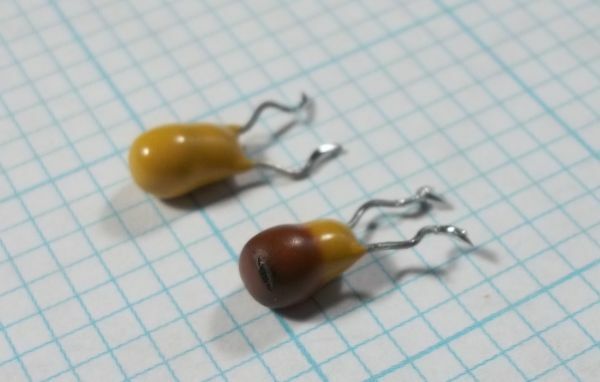 Adding an internal fuse in series with a low impedance capacitor seems to partially defeat the benefit of low impedance, while it will calm fears about spectacular meltdowns. I am probably repeating myself but not in this thread (yet). The only time in recent history that I intentionally used a tantalum capacitor was back in the -80s in a kit CX decoder (vinyl playback NR), to mimic more precisely the DA of a tantalum cap used in the encoder compression side chain time constant circuit. This was arguably grossly over engineered but I was inclined to do things like that.